All great cooks have a secret or two. Like using Ritz Crackers to add a buttery flavor to crab cakes—and a touch of cayenne to give them just the right amount of zing. Whisk egg and dressing in large bowl until well blended. Add crabmeat; mix well. Gently stir in remaining ingredients. Let stand 3 min. Shape into 24 cakes, using about 1 Tbsp. crabmeat mixture for each. Place in single layer on baking sheet sprayed with cooking spray. Bake 5 to 7 min. on each side or until heated through and golden brown on both sides. Prepare with KRAFT Lite Ranch Dressing, KRAFT Reduced Fat Parmesan Style Grated Topping and RITZ Reduced Fat Crackers. Serve topped with KRAFT Cocktail Sauce or TACO BELL® Thick & Chunky Salsa. 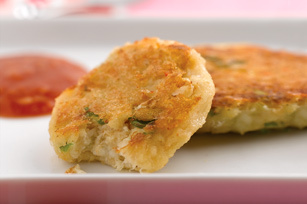 Cook crab cakes in large nonstick skillet sprayed with cooking spray on medium heat 3 min. on each side or until golden brown on both sides and heated through.